A luxurious stay at BodyHoliday is good for the soul. 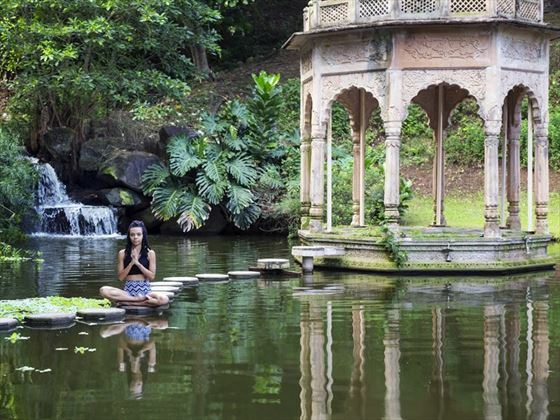 An all-inclusive wellness sanctuary nestled on the northern tip of St Lucia, those hoping to revitalise the mind, body and spirit would do well to travel here. We love just how unique this haven is, offering a tailor-made experience that will leave you feeling relaxed and ready to take on the world. You’ll struggle to find anywhere like BodyHoliday. Admired as the Caribbean’s ultimate spa holiday, days are spent at your own pace, and can be as active or as peaceful as you like. Every morning, you’ll wander along to the beach to check out the blackboard, detailing the activities available for you to enjoy. Yoga classes, abseiling down river gorges, hiking, spin classes, scuba diving…the activities here are brilliant. But, if you’re hoping for a holiday that’s a little less energetic, you can simply spend your time relaxing on the beach and enjoy your daily complimentary spa treatment. It’s entirely up to you.The hotel also provides a great list of events throughout the year. The locally sourced food here is phenomenal, all created with fresh ingredients from the resort’s organic garden. Enjoy a laidback pizza at Pavilion, a chilled eatery nestled right on the boardwalk, or treat yourself to indulgent sushi and Asian fusion cuisine at elegant Tao. We love the personal approach here. Give it just a day or two and you’ll be chatting to staff as if they’re old friends, meeting new like-minded people as you put yourself through your paces or sink your toes in the sand. It’s one of our favourite Caribbean hotels for solo travellers too, with no single supplement when staying in a Single Garden Room. 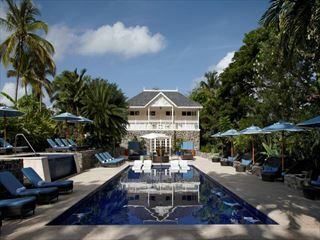 Further reading: BodyHoliday is featured in our guide to the top 10 honeymoon hotels in St Lucia and top 10 spa hotels in the world. 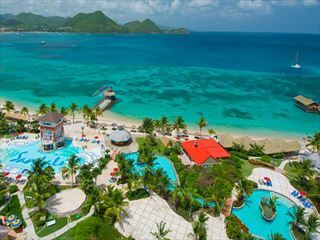 The resort is nestled in a gorgeous crescent of fine white sand, overlooking the sparkling blue Caribbean Sea on the Northern tip of Saint Lucia. 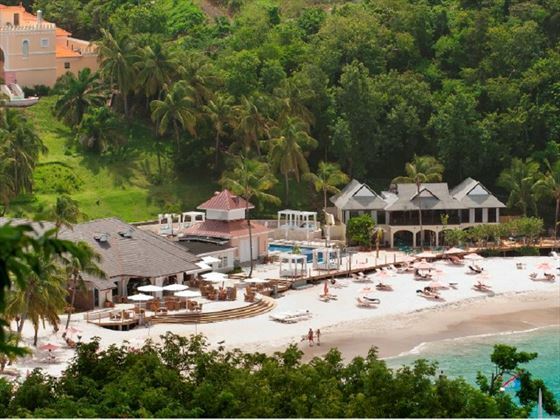 The resort holds a perfect tranquil and relaxing atmosphere with the beach on its doorstep, whilst being in close proximity to lots of Saint Lucia’s popular areas. Single Garden Room - these smaller yet spacious 21sqm rooms carry no single supplement which makes them perfect for solo travellers. Sleeps a maximum of one adult. Luxury Room – these spacious 30sqm rooms overlook the gardens, with either a four-poster king size bed, or two queen beds. Sleeps a maximum of three adults or two adults and one child aged 12-16 years old. Luxury Ocean View Room – these 30sqm rooms have the same facilities as a Luxury Room but situated on a higher floor with tranquil ocean views. Sleeps a maximum of three adults or two adults and one child aged 12-16 years old. Luxury Ocean Front Room – located adjacent to the sea, with extravagant furnishings and a contemporary bathroom. These 30sqm rooms are also fitted with eco-friendly power control systems. Sleeps a maximum of two adults. Grand Luxury Ocean Front Room - offering panoramic views of the beach and the sea with a standalone bathtub and a large, furnished balcony. 40sqm rooms that sleep a maximum of two adults. Grand Luxury Ocean Front Junior Suite – beautiful 49sqm suites with the added luxury of a spacious seating area. Sleeps a maximum of two adults. Grand Luxury Ocean Front Suite – luxurious top floor suites with a separate living room, marble floors, and a generous double-sized balcony with sun loungers. These 60sqm suites sleep a maximum of two adults. Penthouse Suite – indulgent open-plan suites with a large living area, a wet-bar, a soaking tub for two and a spa bathroom with a steam room and rain-head shower. Sleeps a maximum of two adults. TAO – this is BodyHoliday’s signature restaurant serving a fusion of east and western cuisine. It’s one of the Caribbean’s finest with lovely views of the sea, and reservations are recommended as tables fill up quickly. Open for dinner from 7pm, with the last seating at 9.30pm. The Pavilion – offering an extensive and delicious buffet selection alongside a grill and pizza oven. Open for lunch from 12pm to 2pm, for afternoon tea from 4pm to 5.30pm, and dinner served from 6.30pm to 9pm. Not open for dinner on Wednesdays and Sundays. Cariblue – serving a buffet breakfast and lunch followed by an a la carte dinner, this relaxed restaurant is perfect for whenever you feel hungry. Lunch is a real treat – there’s a huge range of options with the added benefit of great healthy options you don’t usually see on a sumptuous buffet, you can indulge in whichever way suits you. Open from 7.30am with the last seating at 9.30pm. The Clubhouse – offering elegant afternoon tea followed by a great menu in the evening, open until 12.30am. The Deli – Mediterranean-style deli offering a range of snacks and light meals for lunch. Open from 9am to 5pm. 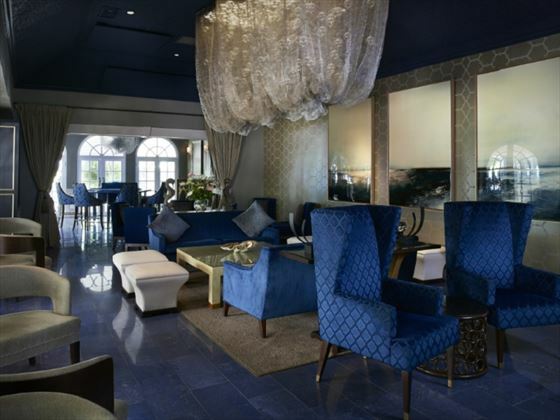 The Piano Bar – this sophisticated bar offering great drinks and an elegant atmosphere with a professional pianist tickling the ivories every night except Wednesday, it opens at 7pm and closes when the last person leaves – the suggested smart dress code only adds to the chic ambience. The Wine Salon – offering guests an extensive collection of fine wines to taste, paired with complementary sides of cheese, fruit and stone oven pizzas from The Pavilion. 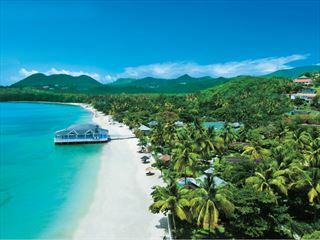 Sandals Halcyon Beach best defines the Caribbean, set on a palette of lush gardens bordering the tranquil Caribbean Sea. Lush tropical gardens transport you to a world of romance where at this resort, no building is higher than the tallest palm.